Glebe Primary School in Rayleigh, Essex has upgraded the heating systems serving its Infant and Junior School buildings with the installation of two sets of two Quinta Pro 115 condensing boilers on a bespoke-designed Remeha rig system. Now part of the Rayleigh Schools Trust, Glebe Primary School formerly came under the local authority of Essex County Council. Following a routine condition survey, Essex County Council recommended replacing the existing sectional cast-iron boilers, which had reached the end of their lifecycle, with advanced, high efficiency condensing boilers. Reliability was a key requirement for the school together with ease and speed of installation as the refurbishment project was scheduled to be completed within a tight, fixed timeframe. Spyros Sergiou of Triglyph Engineering Service was the M&E consultant on the product, working alongside heating contractor Balm and Davies and principal contractor Mitie. As a preferred supplier of Essex County Council, Remeha boilers now serve many schools in the county due to their reputation for quality and high performance. Spyros therefore recommended installing four energy-saving Remeha Quinta Pro 115 boilers on two bespoke-designed rig systems to meet the requirements. The bespoke design enabled all the space and access restrictions relating to the plant room at Glebe Primary School to be addressed at the design stage. This resulted in a more compact design, enabling faster installation and reduced on-site labour and costs. For the school, a further advantage of the detailed forward planning process was that the cost, size and specification were all fixed and in place before the bespoke rig was built. This helped keep the project on time and on budget. Using a prefabricated heating solution like the bespoke rig system reduces the intensity of skills required on-site. For schools this means added flexibility as the safer conditions, combined with the rapid changeover, enable boiler replacements to be carried out outside the holiday period. As part of the refurbishment at Glebe Primary School, a new Building Management System has been fitted to enable accurate control and operation of the boilers. 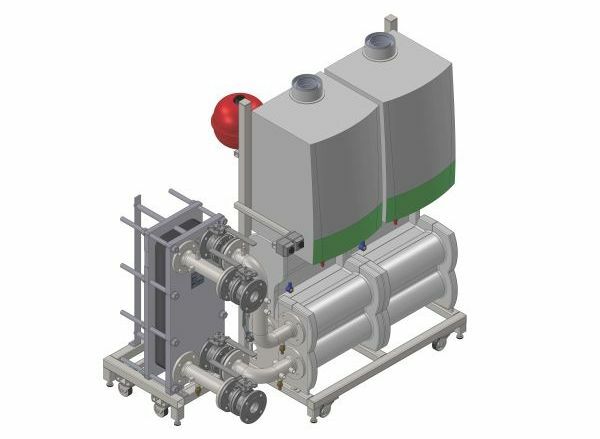 The design also uses a variable temperature circuit to maintain low flow and return temperatures, further maximising boiler and system efficiency. The off-site fabricated bespoke heating solution has achieved an excellent outcome for all. The school is benefiting from reliable, high-performance heating which is generating a more comfortable learning environment for the school’s children and staff. The more efficient heating will also lower operating costs due to reduced energy use and easier future maintenance, helping stretch the school budget further. At the same time, the cleaner operation and ultra-low NOx emissions will minimise its environmental impact. For the contractors, Balm and Davies, the prefabricated rig system has enabled them to schedule the project and team more accurately to meet the skills base and so increase site productivity. To find out more about Remeha’s bespoke rig service, contact your Expert Area Sales Manager or visit the manufacturer here.